1: ferdinand : vit bottle cage of steel wire with automatic spring tension. 2-3: casnat : cylinder head support welded under the poulain fuel tank. passage of lighting wire through rubber insulator in the mudguard. 4: follis : rear of sachs 98cc. tandem, showing the seat tube forming a fuel tank with the principal beam. notice the wingnut allowing the escape of gas fumes during filling. 5: ferdinand : chrome-plated seatstay caps and twin-bolt seat post binder. 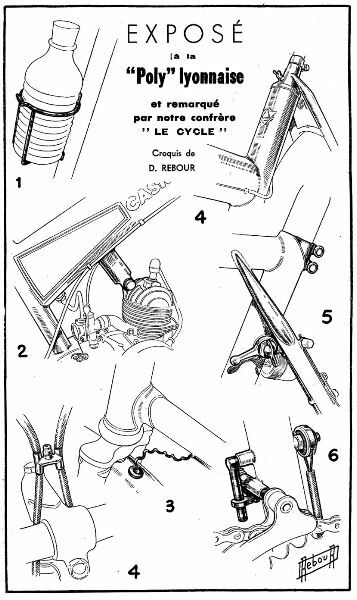 the lever controlling the dynamo is under the seatstay, against the seat tube. 6: liberia : front derailleur controlled by cable.